The expedition was led by famed oceanographer Robert Ballard. It captured the wreckage of the USS Independence, located half a mile under the sea in the Greater Farallones National Marine Sanctuary. The sanctuary is off California. Scientists aboard the ocean research ship Nautilus lowered two unmanned submersibles to the ocean floor. They also found a Hellcat fighter plane, anti-aircraft guns, hatches and the ship's name on the hull. "What's so wonderful about the wrecks in deeper water, like this ship . . . is that they are in amazing states of preservation," Ballard said. "There's very little change from when the Navy scuttled it." That happened in 1951. "The deep sea is the largest museum on Earth." Samples of marine life growing on the ship will be brought onboard the Nautilus. They will be tested for possible radioactivity remaining from the bomb tests. The samples also will be analyzed for the effects of climate change. 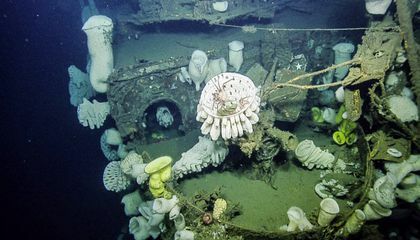 Scientists plan to explore the wreckage of a historic steam yacht from 1886 and the freighter Dorothy Windermote as part of the four-month expedition. Earlier in August, the Nautilus team discovered a "googly eyed" stubby squid while combing the sea floor off the California coast. Video of the researchers delighting in the discovery became an Internet sensation. To watch round-the-clock video of the expedition, visit www.nautiluslive.org. In response to "Underwater expedition finds Sunken Warship", I agree that the plane would be found on the ship. One reason I agree is because it stated the article that the ship has been highly preserved because of how deep the water is. Another reason is it has only been in the water since 1951, according to the article. It is fascinating to think it was a target for Nuclear weapons testing in 1946 according to the article. Even though the ship is been sunken 56 years ago, it is still a cool piece of history and a home for marine animals. This article is about the mysteries of the underwater world and the ships that have sunk there. Robert Ballard and his crew investigated and photographed the marine life attached to the ship. The crew took samples of the things growing on the World War 2 aircraft carrier. They are testing whether they have been exposed to radiation or climate change. This comment is about the article underwater expedition finds sunken warship I found this article interesting for numerous reasons. One of the reasons I liked it because of the atomic bomb testing they are testing to see if the sea life down there is radioactive from a bomb detonation from the 1940s. The second reason I liked this article because they talked about the wreckage being intact meaning the study it and learn from the mistakes possibly improving ship design. The third reason I liked this article is because also the ship was intact preserving history for people to study and see it. In conclusion this article was good for numerous reasons including the history behind it. It's amazing how there is another world that we don't fully know of underwater. A plane was found with the ship because it was a airplane runway on the water. When the runway went down so did all the airplanes. The airplane was found with guns and other weapons. I think this is really cool how they found this ship from WW2 because this is a big part of our history. 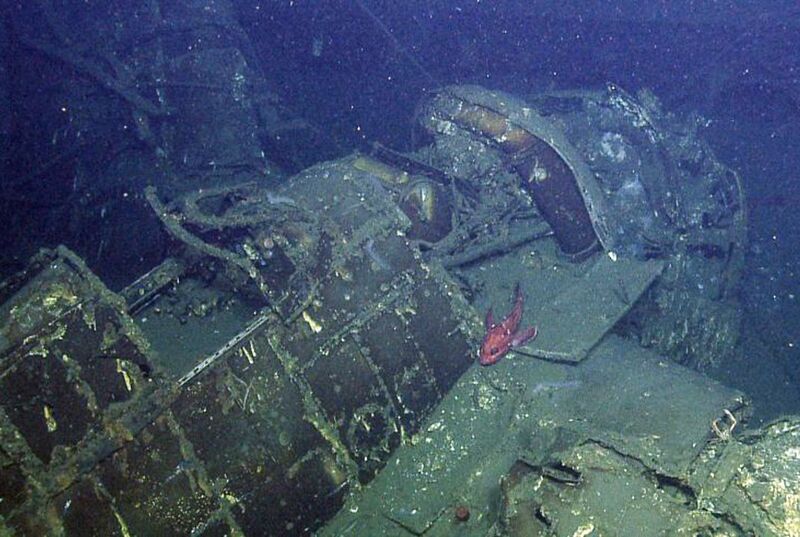 It was found with the ship because it was an aircraft carrier used for atomic bombs. The ship was carrying the plane to take off in the ocean but it never took off so it was left with it. My opinion on this article is that it is very interesting. The Plane Was Found With The Ship Because, The Carrier Was Classified As A World War II Carrier. As An Aircraft Carrier, and carriers hold planes. Also If It Was Classified As A World War II Vehicle. The Plane Was Discovered Because Of The Simple Fact That Aircraft Carriers hold planes, it possibly was gunned down due to the carrier Having ''Anti-Air Guns'', Probably was battling... So if people Wondered How And Why The Plane Was Found With The Carrier is Because The Simple Fact Of We All Know Carriers Hold Planes And it was classified as a war carrier and The Hellcat Fighter Was Probably A War Plane. So The Plane Either Was Shot Down or it never took off! So Its Cool What They Found but the Full Idea OF Mine OF Why the plane Took Off Was Because We All Know Carriers Hold planes and the carrier was classified as a war ship, then The Plane Either Never Took Off or Gunned Down. All We Know Is That The Carrier Independent Held A Hellcat Fighter Plane Or The Plane Was Gunned Down.